Do you want to integrate cultural awareness into your homeschool, public school, or Sunday-school curriculum? 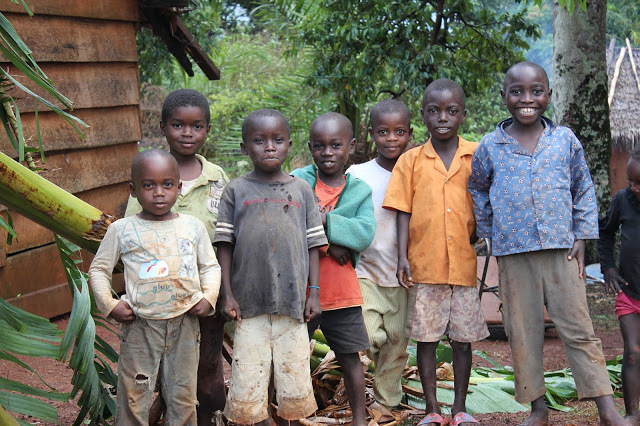 Here are some fast facts about the lives of Bakoum children! Bakoum children can be seen carrying sugar cane, sucking out the sugar, then spitting out it’s pulp. During mango season there are buckets of mangos all over Bakoum villages. Bakoum children love to eat them as well. However, their families warn them that if they eat too many mangos, they will get malaria. Because of this, many mangoes rot on the ground. There are also sugary-sweet pineapples that grow on bushes in Cameroon, as well as papayas that children climb trees to get. But more than anything, Bakoum children love what they call kaando which is kind of like a long potato that grows in the ground. They soak it, take off its husk, and let it dry in the sun. It looks like a pile of white rocks laying out in front of peoples’ houses. Once it is dry, their mothers or sisters often boil it and serve it with a side of leaves or vegetables. It has the consistency of bread dough. And of course, Bakoum children, when they have a little money, love to go to the market and buy candy! Bakoum children have lots of brothers and sisters! It is not uncommon for a Bakoum boy or girl to have 8-9 brothers or sisters and to share a room with 4-5 of them. Bakoum children love it when their mothers have another baby because they love playing with them. Because the mothers have so many children to care for, often a child as young as 5 or 6 years old will watch their baby brother or sister throughout the day. In Bakoum culture, whoever is the oldest is the one with the most authority. In America, mothers and fathers often tell kids what to do, but it Bakoum culture, whoever is older takes the role of the mother or father and tells their younger brother and sister what they can or cannot do. Younger children are taught by their parents to obey their older brothers and sisters. When it comes to discipline, anyone older has the right to discipline anyone younger than them. Also, parents do not stop disciplining their children when they become adults. In the mind of the parents, their sons and daughters are always their children that must be brought into submission through corporal punishment. Usually the punishment is done publicly in front of the house or in the street. Parents generally don’t mind if their children do things like lie or have boyfriends / girlfriends very young. However, what makes parents really upset is if a child brings shame to their family. If a child gets caught stealing, for example, the parent will discipline the child in front of the one they stole from to show that they take it very seriously. In American culture, if someone hits you, oftentimes the children are taught to go tell an adult. This is not the case in Bakoum culture. If one child hits another, the adults do not want the child to come and tell them. Instead they say, “Take your revenge” and encourage the child to go hit the other child back. Also, in Bakoum culture, when a child’s older brothers and sisters start having their own children, they continue to live in the same house as their parents. So, under one roof is often found grandmas, grandpas, moms, dads, grandchildren, cousins, aunts, uncles, brothers, and sisters. 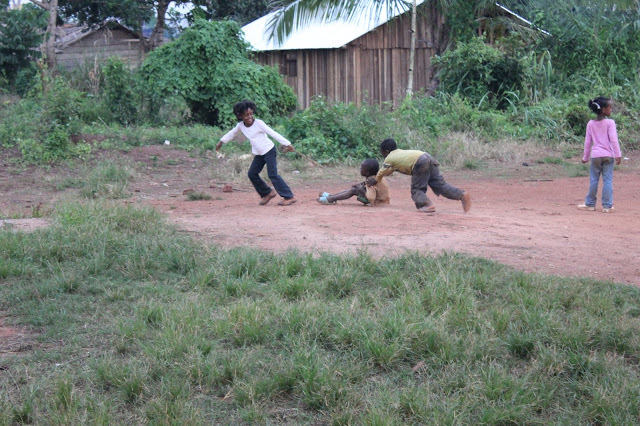 Bakoum children love to play! They usually don’t enjoy playing in the rain and in the mud, but they love to dance and they love to spend time with one another. They enjoy playing soccer and often play it without shoes on and with lots of elbows. They also like to play games with rocks which is similar to the game of Jacks in the United States. Little girls find old bottles and yarn and put the yarn on the top of the bottle to make little dolls. Boys will take a type of plant similar to wicker and make it into toy cars. Or they will find sardine cans and make them into toy cars with rubber as its wheels. They also love to play with old tires and wheelbarrows they find in the village. Sadly, many Bakoum children are not kind to animals and think that hurting them is fun. 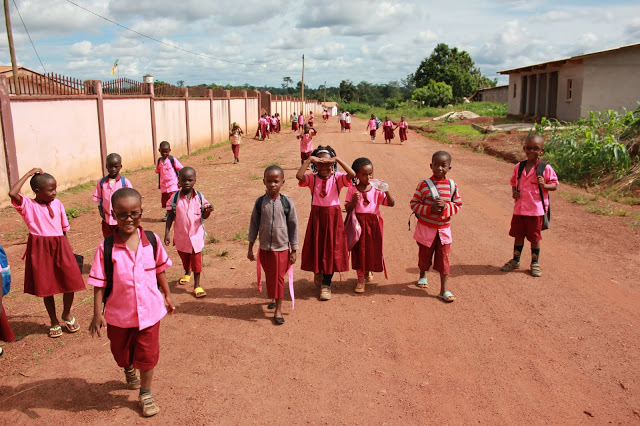 The government in Cameroon does not require children to go to school. Bakoum children usually do not go to school because they need to work in their parents’ fields in order to have enough food to eat. If they do go to school, many of their schools do not have books! Sometimes there are 100 children in one classroom and they sit on the floor and learn from a teacher who stands in front of them. They learn to write in cursive and they also do a lot of dancing at school. Bakoum children love to dance! 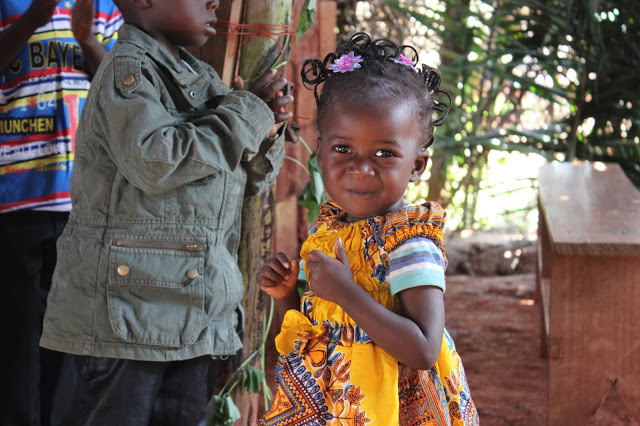 If a Bakoum child does go to school, they all wear matching uniforms that a seamstress makes especially for them. When you go outside in the mornings, you can see children walking to school with all different colored uniforms – it is beautiful! Bakoum children go to school to learn French, but most of them prefer to speak Bakoum. There is no running water in Bakoum villages, so most Bakoum children have never seen a sink. 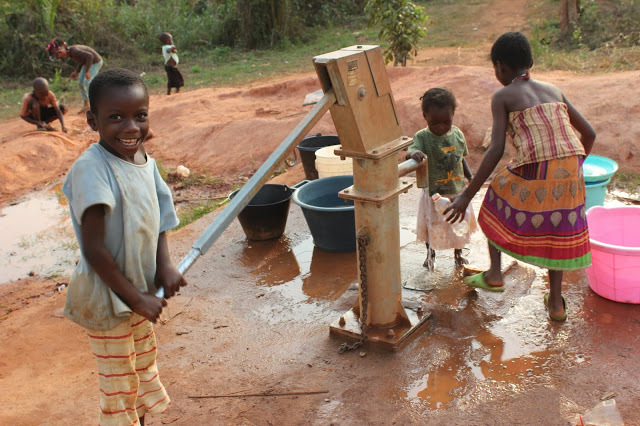 Instead, they to go the well to draw water and have fun talking to their friends along the way. They start as really young children and carry little tupperwares of water on their heads from the well all the way to their house. By the time they reach the house, there is no more water in the tupperware because they’ve spilt it all on the way. This makes the whole village laugh! But, as the child gets stronger and stronger, he or she is able to haul lots of water home for his whole family. 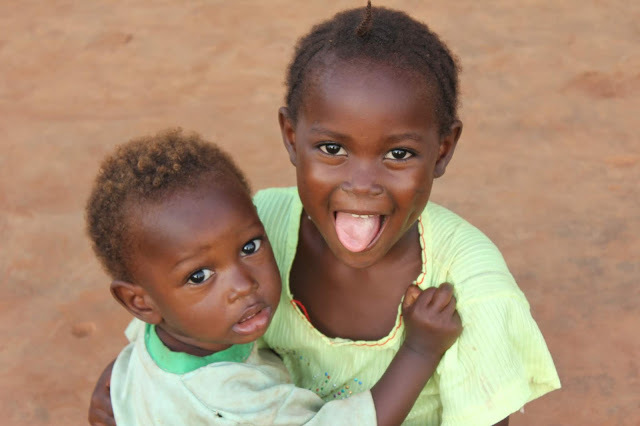 Little Bakoum girls have the responsibility of cooking, cleaning, and caring for the younger children. Little Bakoum boys do not have many household responsibilities. 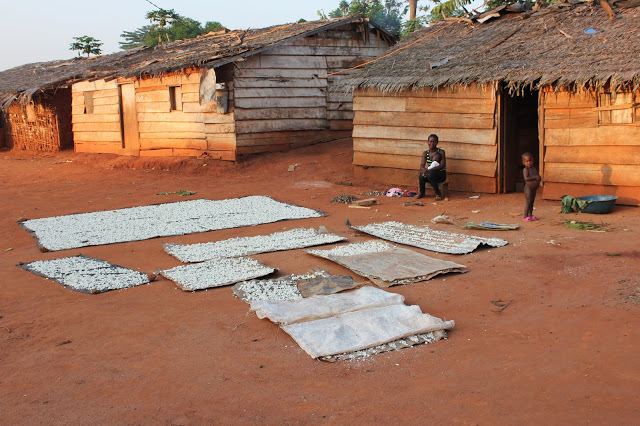 Bakoum children believe that when someone dies, their spirit stays in the village with them. These spirits are sometimes angry and scare children at night. Bakoum children do their best to make these spirits happy. They also believe that there are witches and sorcerers that live in plants and transform themselves into animals and hurt people. Because of this belief, they are very careful to not touch certain plants, and do all that is necessary to keep the witches and sorcerers happy. Bakoum children believe in a creator god they call Shambu, but this god is not the same as the God of the Bible (he has 12 wives…). Bakoum children need to hear about the God of the Bible who sent his Son Jesus to die for their sins.